Atlas bearing the heavens in the form of an armillary sphere from William Cunningham, The Cosmographicall Glasse, London 1559. The verse at the bottom of the engraving is from Book I of Virgil's Aeneid, in which Atlas is referred to as a teacher of astronomy. The spheres of heaven have featured in the works of philosophers, pedagogues and astronomers working within literary genres, and in those of poets and authors treating philosophical and cosmological themes. It is therefore possible to find allusions to the celestial sphere, even descriptions of it and its divisions, in such works as Boethius' The Consolation of Philosophy, Martianus Capella's The Marriage of Philology and Mercury, Macrobius' Commentary on the Dream of Scipio, Dante's Divine Comedy, and Chaucer's The House of Fame. But mention of armillary spheres per se in poems and literary works is less common. One example may be Ovid's mention, in his Fasti, of the spherical model produced by Archimedes and earlier described by Cicero. The poet Claudian (340-410) wrote an epigram on the same instrument, which he described as having a sphere of glass. However, it is not clear to what extent Archimedes' device can be identified with the demonstrational armillaries of the middle-ages. 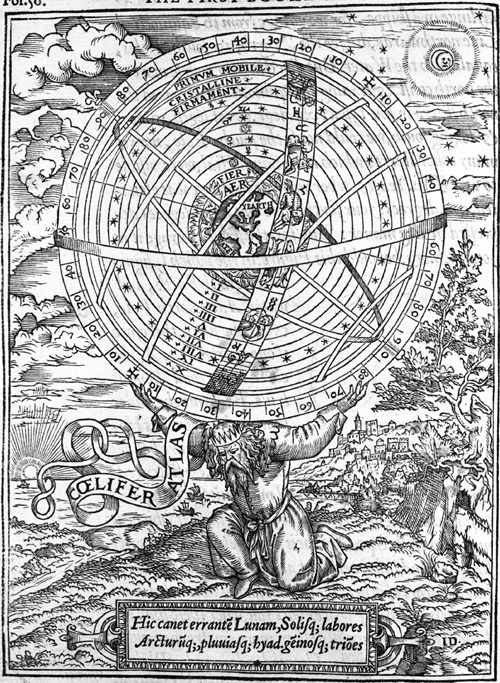 In the early-modern period, depictions of the celestial sphere often took the form of an armillary, although medieval diagrams had typically been much more schematic. In connection with this there arises another link between the instrument and the poet Ovid, since the Metamorphoses was one of several classical sources of a motif, Atlas as bearer of the heavens, which was used by both instrument-makers and artists. Armillary spheres, as well as terrestrial and celestial globes, were frequently provided with a decorative stand representing either Atlas or the hero Hercules who had borne his burden for a time, and often the celestial sphere was portrayed in the same way. This practice was widespread until the eighteenth century, and has been revived on occasion since. 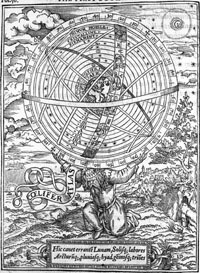 More generally, armillary spheres have featured in portraits of astronomers, astrologers and mathematicians since the late-middle ages, and have often been used as the attribute of Astronomia, the personification of the art of astronomy, or Urania, its Muse. Appreciated by rulers as symbols of worldly dominion, armillary spheres have also been employed to represent contemplation of heaven (in saints' portraits and emblems), and universality.